As a somatic alternative to mind-based or conversation-based therapy, the Trauma Resiliency Model (TRM) addresses the physical effects of stress caused by traumatic events. TRM recognises that trauma is experienced first and foremost through the body’s senses, where it is stored through the nervous system. 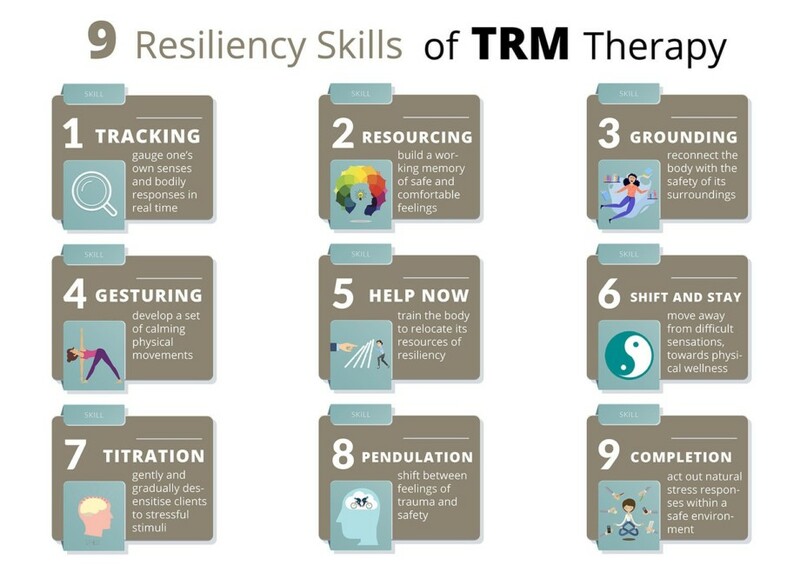 By focusing on training the client to develop a distinct set of resiliency skills, TRM helps build healthier pathways within the body’s muscle memory. While other forms of therapy deal effectively with troublesome thought patterns, TRM intercepts harmful stimuli before they even become thoughts, by deflecting them when they first enter the body’s sensory system. This approach allows clients to resist the physical strain that accompanies stress caused by trauma. The skills taught within TRM can be practised by people of all ages, and in response to all types of traumatic experiences. The therapy aims to increase overall trauma resilience, allowing the participant to deal more effectively with stressful events that occur in life. TRM at The Dawn Rehab empowers individuals to handle their traumatic memories with greater equanimity, and re-calibrate their nervous system according to this new and more durable response model. The trauma resiliency model is based around building an awareness of the body’s internal state. The concept overlaps in certain respects with traditional meditation, although its structure has been enhanced and repurposed for greater effectiveness toward the specific challenges of trauma recovery. Nine distinct skills are at the heart of TRM therapy sessions. Upon learning them, clients become far more adept at controlling their internal responses to stress. At The Dawn, clients often enter our TRM rehab programme because they feel they are caught in a bind. Stress triggers encroach on their personal space and emotional well-being, and their nervous system responds as though it is under direct threat. The trauma resiliency model provides relief from this bind by maintaining an atmosphere of freedom. Our TRM therapists use welcoming language, giving clients freedom and inviting them to participate in each exercise only if they wish. The standard treatment process includes both individual and group therapy meetings, with a typical week consisting of 5 one-hour sessions. Clients keep a sense of control throughout each therapy session, gaining confidence with each personal achievement. These successes prompt a release of anxiety, allowing the client to devote more and more strength to the recovery effort. Furthermore, each successful practice of trauma resilience techniques can help train the body’s internal systems to follow these new, healthier response patterns. When the body’s nervous system is kept on constant alert for potential threats and triggers, it loses the ability to rest and maintain itself for the long term. A strict focus on mental recovery can be highly effective, but may nevertheless fail to fully treat the physical aspects of exposure to stress-inducing images, sounds and events. Moreover, some survivors of trauma find it difficult even to speak about the events that affected them, making conversation-based treatments difficult to begin. Our TRM rehab programme requires no confrontation with the source of their trauma, and therefore no need to reshape the story into a more manageable narrative. By focusing on resiliency skills alone, TRM lets the individual take back control of their body, opening the door to further methods of treatment. Neuroscientific studies confirm that trauma can cause physical damage at the cellular level, disrupting operation of the body’s neurotransmitter and neuroendocrine systems. Trauma has also been linked to shorter telomeres, potentially interfering with proper transcription of DNA. Each of these phenomena have been observed in connection with childhood trauma in particular. Notably, childhood trauma itself is more common than many people realise. The Centers for Disease Control and Prevention in the United States conducted a large-scale study which found that nearly two-thirds of insurance-holding adults had suffered from at least one Adverse Childhood Experience (ACE), a category which includes experiences such as physical abuse, molestation, or witnessing domestic violence. The same study found that fully 22% of respondents experienced at least three such episodes during their childhood. Links have been well established between the various physical effects stemming from trauma, and an increased risk for serious medical conditions such as heart and liver disease, drug and alcohol addiction, cancer, and depression. Research focusing on the treatment of people affected by at least one ACE has found that TRM’s model of creating positive neural imprints can minimise the harm from such events. Given the observable physical consequences of trauma, somatic resilience therapy takes a direct approach to healing the body. Such methods have indeed been studied, and found to be remarkably successful. Even a single 75-minute course of resilience therapy has been shown to significantly improve client outcomes with immediate effect. When clients returned for follow-up observation four weeks later, their improvement was again noted – as it was upon another assessment eight months after the original treatment. Certain specific cases have allowed for additional testing of core TRM methods. In the aftermath of Hurricane Katrina in the United States, a study was carried out among social service workers who were exposed to traumatic events. The group that received TRM treatments showed immediate improvement, which remained evident months later during a follow-up examination. The trauma resiliency model is part of the holistic set of treatments available at The Dawn, and can be used in combination of other forms of therapy. At The Dawn, we provide complete personal support throughout the period of recovery, using fully qualified therapists and medical staff who are on call 24 hours a day. Our 1:1 client-to-staff ratio lets us offer personalised care in a comfortable environment. For more information about how we can help you or a loved one recover from a traumatic experience, contact The Dawn today.